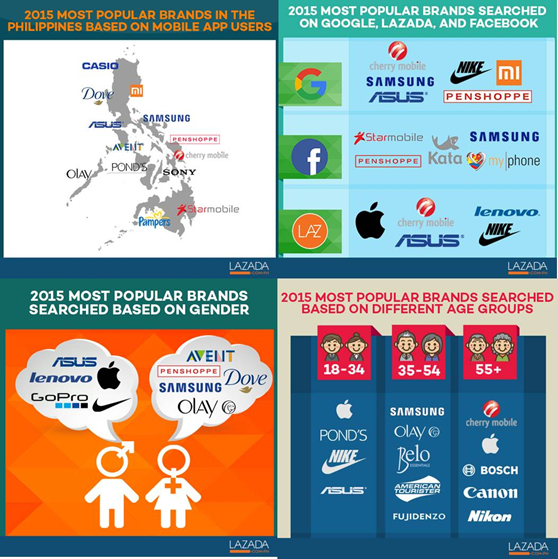 Thought Peek: What Brands are Filipinos Buying Online? MANILA, PHILIPPINES - Brands have become an essential consideration in making purchase decisions. Lazada- the Philippines’ One-Stop Shopping and Selling Destination is no stranger in understanding consumer behaviour towards brands specifically in the online retail space. 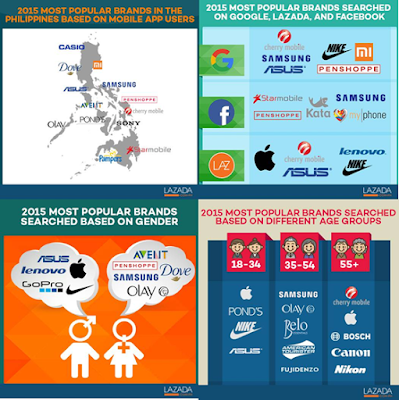 In a study conducted by Lazada on which brands Filipinos buy online, Penshoppe, ASUS, and Cherry Mobile showed strong affinity with online shoppers evidenced by local Google search results as well as search and sales within the Lazada website and mobile app. Camera brand Canon and power tool brand Bosch remains to be popular among consumers aged 55 and above. The rest of the findings are illustrated in the infograph as below. Lazada through its Marketplace Platform, works in partnership with the biggest local and international brands to provide Filipinos with a large assortment of products across electronics and lifestyle categories. "The number of consumers looking to buy beauty products online is increasing, so partnering with Lazada seemed to be the best way to expand into the online shopping space,” says Khristine Santos, Customer Development Manager of Belo Essentials. “We regard Lazada as the most trusted e-commerce company in the Philippines and as a consumer brand, consumer trust is very important for us to grow. It allows us to easily track results and we are able to develop a better understanding of our online market,” Santos of Belo Essentials added. This September 15-17, Lazada, together with its brand partners, is staging its first Brands and Sellers’ Showroom (www.lazada.com.ph/brands-and-sellers-showroom) - offering exclusive discounts of as much as 80% on select bestselling items across all categories- both available on desktop and in the Lazada Mobile App. The Brand and Sellers’ Showroom aims to showcase Lazada’s most-loved brands at their best prices. Participating also in the Brand and Sellers’ Showroom is Alcatel where the Alcatel Flash Plus will be holding its last sale of the Alcatel Flash Plus at PhP 6490.